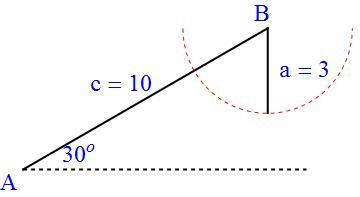 Suppose that , , and the nonincluded angle are given, and we are supposed to solve for , , and . As we’ve seen in this series, there are four distinct cases — and handling these cases requires accurately solving equation like on the interval . the is greater than 1, which is impossible. We conclude that , so that is a right triangle. so that there are two possible choices for , and . so that there are two possible choices for , and . However, when the second larger value of is attempted, we end up with a negative angle for , which is impossible (unlike Case 3). If they can remember this fact, then students can just follow their noses when applying the Law of Sines, identifying impossible and ambiguous cases when the occasions arise.